Think about the last time someone promised you something. Did they keep their promise? Did they break their promise? How did their promise make you feel? Are you tired of promises not being kept by your family, friends, boss, co-worker or even yourself? 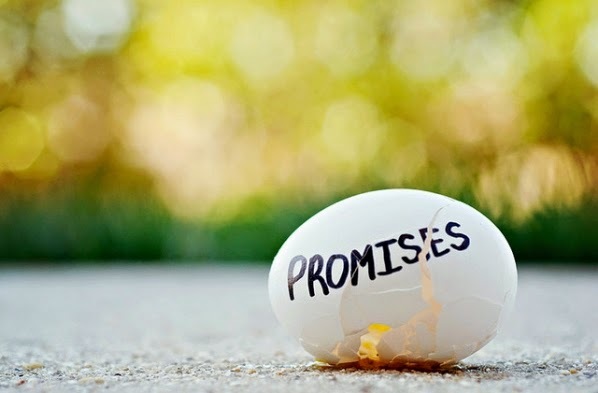 Does this egg depict your image of promises? Broken! You can count on the promises of God...every time! I've listed five of my favorites of the MANY promises of His Word. It may help to memorize these for reassurance when others neglect to carry out their promises. A promise is a serious vow of your character. Broken promises make you untrustworthy. If you think about it, just being asked to "promise" may be a sign you've let someone down already. Be careful making promises to people. A fulfilled promise may not always be remembered but a broken promise will never be forgotten! Leave me a comment and let me know what your favorite promise of all time is!